The wiring devices from Volex Accesories have been designed to perfectly complement modern interiors, offering an unobtrusive and sophisticated look totally in keeping with today's design. Technically, they meet British Standard requirements with patented features that make products the most advanced and safest available. Sleek & slim brushed brass plate with softly rounded corners, matching bolts are provided. Angled in-line colour coded terminals and captive screws and dual earth for easy install. 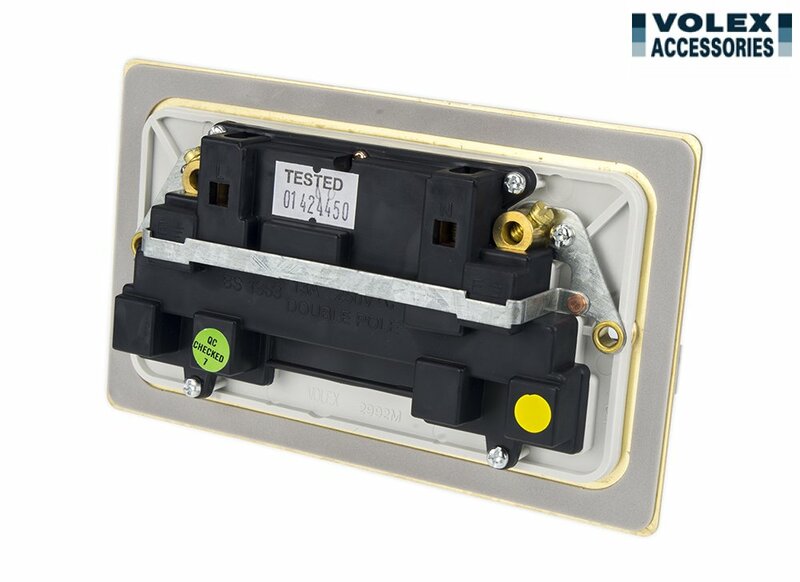 The Voles 2 Gang 13A DP Switchsocket has a 3-pin operated shutter system to inhibit access to the electricity supply, unless all 3 pins of a British standard 13 Amp plug are in position. The terminal screws are backed out and held captive within the terminal housing. This product also has double pole switching which means it switches both live and neutral and is added safety for the user. All wire for this product can be cut to the same length as all terminals are in line. the product is finished in a tasteful Brused Brass, with white interior which maintains the posh appearance. About the producer: Volex Accessories has always been a name synonymous with reliability and value. Committed to adding extra quality features and contemporary aesthetics to its designs, Volex Accessories has recently launched a new generation of products which combine the latest looks with value for money and product features customers expect. Volex Accesories brand belong to the Siemens group of companies.